The Joint Commission cited suboptimal communication as one of the root causes in 82% of sentinel events reported on 2010. Face‐to‐face communication is the richest form of communication and is superior to asynchronous modes of communication such as text paging. Additionally, physical dispersion of providers has been characterized as a barrier to ideal communication. Geographic localization consists of co‐localizing patients and their treating physicians onto the same physical hospital unit. This has been shown to increase the quantity of multidisciplinary communication but the quality of communication remains suboptimal (i.e. accurate communication of plan of care is unchanged). Structured Interdisciplinary Rounding (SIDR) consists of daily, template‐driven interdisciplinary rounding on patients among care providers. Prior literature has shown that the adoption of SIDR improves the quality of multidisciplinary communication. Concurrent implementation of geographic localization and SIDR (GSIDR) has not been studied in regards to communication outcomes. In October 2012, the Internal Medicine teaching service at MGUH concurrently implemented geographic localization and structured interdisciplinary rounding (GSIDR). The purpose of this study was to assess the impact of the implementation of GSIDR on the quality of interdisciplinary communication and the quality of patient‐perceived communication. In regards to interdisciplinary communication, a significantly higher agreement to ”physicians and nurses here work together as a well‐coordinated team” was observed in both residents (p = .0018) and nurses (p < .0001). 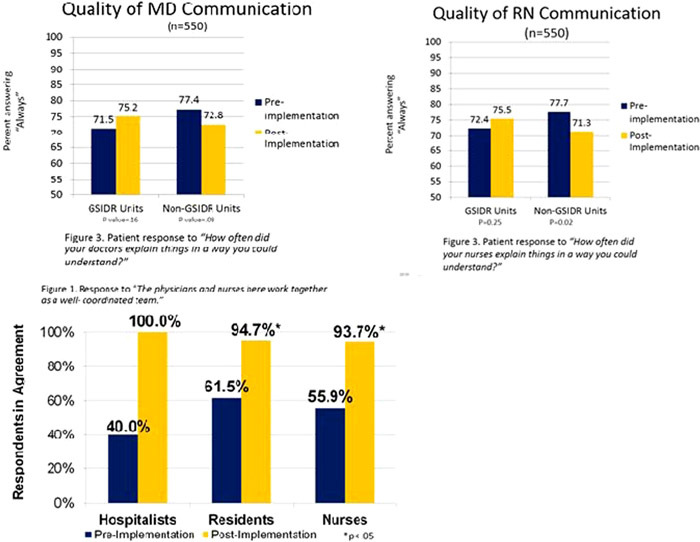 Additionally, residents and nurses reported higher agreement to the statements “I am satisfied with the quality of collaboration…with nurses/physicians” (61 to 94% with p = .018 for residents; 56 to 94% with p<0.0001 for nurses). In regards to patient‐perceived communication quality, a non‐significant increase in the proportion of GSIDR‐unit patients responding “always” to the question ”How often did nurses/doctors explain things in a way you could understand?” was observed along with a concurrent, non‐significant decrease in percentage of patients responding “always” to these questions on the non‐GSIDR floors. The implementation of GSIDR was associated with clear improvement in interdisciplinary communication. GSIDR was not associated with significant improvement in patient‐perceived communication with doctors and nurses. However, a non‐significant trend toward improvement in patient perceived communication was noted. Montero A, Moroni E, Wolk A, Sangkharat A, Ambrose D, Catalino M, Chung A, Adams M. Effect of Geographic Structured Interdisciplinary Rounding on Interdisciplinary and Patient‐Perceived Communication. Abstract published at Hospital Medicine 2014, March 24-27, Las Vegas, Nev. Abstract 124. Journal of Hospital Medicine. 2014; 9 (suppl 2). https://www.shmabstracts.com/abstract/effect-of-geographic-structured-interdisciplinary-rounding-on-interdisciplinary-and-patientperceived-communication/. Accessed April 25, 2019.